Great cities deserve great hotels. 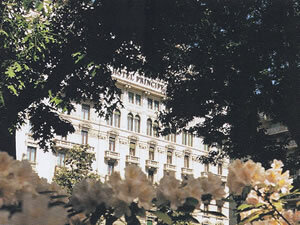 Milan is certainly a great city, and the Hotel Principe di Savoia is, without doubt, a great hotel. It stands, in an attitude of quiet dignity, behind a little park, not far from the outrageously lavish Classical pile which is the city’s railway station. The hotel’s own Classical façade, built in 1927, merely hints at the luxury within. I liked its becoming modesty. Yet, as soon as I walked inside, I liked even more the unashamed sumptuousness of the interior. 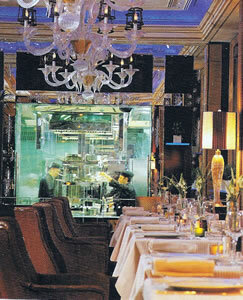 For the public rooms of the Principe di Savoia are a decorative tour de force. If you like gilt, coloured marble, mirrors, stained glass and thick, richly coloured carpet, you will love these spaces. Set aside restraint all ye who enter here: let joy (like the décor) be unconfined. The 400 rooms include 130 suites. These numbers suggest, correctly, that this is the destination for many of Milan’s wealthiest and most important visitors. 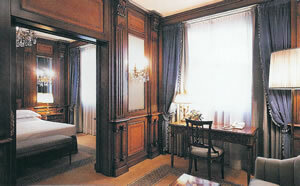 Some of them stay – for a modest 14,500 euros a night, breakfast extra – in the Presidential suite. 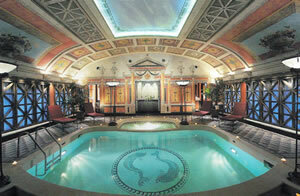 I reproduce for your delectation a picture of the suite’s private swimming pool, decorated in the ‘Pompeian’ style. 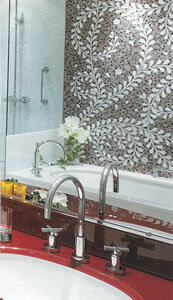 Others, such as myself, are content with more modest – but equally comfortable – accommodation. Room 902 was on the 9th floor. It was called, because of the exquisite decorative feature over the bath tub (pictured), a ‘Mosaic room’ and was priced at 1,020 euros a night, bed and breakfast for two. I reached it through impressive corridors. (As I repeatedly point out to hoteliers, richly furnished corridors are a sure sign of a fine hotel.) The colour scheme of my apartment was a striking contrast to the warm primary colours in the hotel’s public areas. This subtle combination of blue, grey and white was both charming and restful. My view was over the busy piazza della Repubblica, but – so effective was the double-glazing – not a sound penetrated my apartment. Over the beds was a painting of ladies at a well, in the Renaissance style. On the table between the two velvet armchairs was a vase of red tulips. 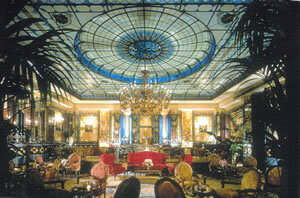 Two small incidents concerning my bed will indicate the excellence of the service at the Principe di Savoia. First, I spotted the dreaded duvet. A word to Housekeeping and it was whisked away and lovely blankets were substituted. Then it struck me that the bed was a little hard for my ailing back. Housekeeping came to the rescue once more, with a soft over-mattress, which achieved a miraculous transformation. No fuss, no drama – just prompt and effective action: what I call good service. My bed having been sorted out, I stowed my valuables in the private safe, ensured that my suits were hanging properly in the (rather small) wardrobe and scribbled the obligatory postcard to Blighty at the marble-topped writing table. Then I set about adjusting the lighting. Few things are as important to the atmosphere of a room as its lighting. 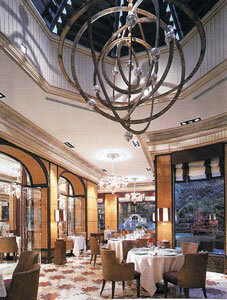 Here the table lamps and the standard lamp were all dimmable, so it took but a moment to create calm and serenity. Next, to aid my pre-prandial ablutions, I needed some music of the proper sort. This came via the television, on a system which enabled me to select a performance of Beethoven’s Fifth Symphony. With Ludwig’s melodies swirling about me, I entered the bathroom. I have already mentioned this chamber’s mosaic wall. Its other delights included a tub of generous size, two wash basins, large white bath towels, a separate shower and (through a sliding door of opaque glass) a loo and a bidet. With the aid of Acqua di Parma toiletries, I shaved and bathed and made myself presentable for dinner. Acanto is blessed with an excellent cellar, with 600 offerings. In the substantial, leather-bound wine list, I found Italian bottles from 20 euros. The ‘super Tuscans’ are well represented, with 2000 Sassicaia (220 euros), 2000 Solaia (200 euros) and 1979 Tignanello (380 euros). From France comes 2000 Mouton Rothschild (1,450 euros), 1999 Latour (600 euros), 1995 Cheval Blanc (750 euros) and 1996 Pétrus (2,800 euros), while Australia yields 1999 Grange (550 euros) and California supplies 2001 Opus One (430 euros). 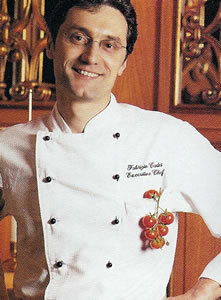 For my own Italian drinking, I trusted the impressive (and properly dressed) sommelier, Frederico Vincenzi. He brought me a glass of white made from the fiano grape, with suggestions of raisins and gravel (Feudi di San Gregorio, 2004 – 6 euros, glass), and the 2000 vintage of one of my favourites reds, Luce (Frescobaldi & Mondavi – 150 euros), which – after decanting – proved as elegant and refined as its exquisite tapered bottle, with hints of the farmyard, oodles of ripe black fruit and lots of residual sweetness. Truly pleasurable quaffing. I returned to Acanto to break my fast, and again sat at a table overlooking the garden. Hither I brought from the buffet a plate of glorious bacon, which tasted just as bacon used to taste when I was a boy, together with baby tomatoes and little sausages. Further fortification was provided by a dish of pineapple, a slice of fruit tart, jugs of coffee and a final cappuccino with my croissant. This was a proper breakfast and set me up for a day of sightseeing. This included, bizarrely, having to look at a vandalized Rolls-Royce Corniche coupé, which the curators of the Museum of Contemporary Art seemed to think was a worthy exhibit. I knew that such vulgarity would never disturb the decorum of my hotel. With its magnificent interiors, its luxurious accommodation, its high level of service and its splendid restaurant, the Principe di Savoia is a much better work of art: a great hotel in a great city. Piazza della Repubblica 17, 20124 Milan, Italy.